Informally when I visit other libraries, I view lean, striking modern designs or historic, revered rooms that are well-stocked and proudly displayed. In contrast, during my visit here in Lisbon, it was a bit of a shock to visit the Instituto Politecnico de Lisboa education library and to be informed by the librarian that they have had no funds for resources for the past six years. 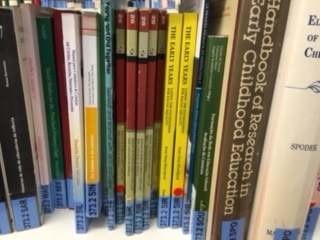 On the shelves, I saw Portuguese and English language texts including IOE authors below, but nothing had been added for years including journals. I was hoping there was better news about databases and I was told that the only database that students have access to is b-on which does not necessarily provide full text resources. The school of education here has about 2000 undergraduate education students and 300 Masters students. 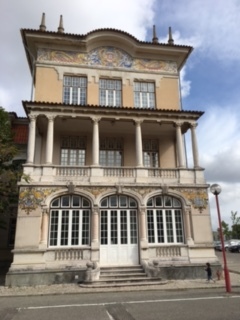 They come to this lovely building below, but I’m perplexed how they can function without current resources although, no doubt, the Portuguese funding situation is a complicated one that reaches far beyond education. I came away feeling despondent until I realised that UCL may be able to provide some kind of support. Firstly, there are our dependable IOE LibGuides which are freely available to all and include a great deal of open access information. Secondly, there is the excellent UCL Press. UCL Press is the first fully open access university press in the UK seeking to make its publications available freely to a global audience. Wi-fi seems decent in Lisbon so as long as students want to or can read English, ebooks and ejournals can be accessed by anyone. UCL Press has been very supportive of my Erasmus visit by providing me with UCL mementoes. Today, I’ll be distributing UCL Press bags with this quote from Daniel Coit Gilman (1878): ‘It is one of the noblest duties of a university to advance knowledge and to diffuse it … far and wide’. I can only hope that the diffusion of knowledge will reach students in Lisbon. This entry was posted in Library and Archives and tagged funding, International education, IOE LibGuides, libraries, Lisbon, UCL Press. Bookmark the permalink.